Just wrapped up my last holiday craft sale... I know my etsy shop has been neglected lately, but I hope to pick that back up in 2011. I've also been a blog delinquent lately, but will get back on the bus SOON. Thanks to all encouraging words and support, and have a terrific holiday! a Drawing A Day for D.A.D. In June, my sister and I began a collaborative project to raise funds for the Canadian Cancer Society. Please drop by and take a look. I was a vendor at the Wolfe Island Music Festival in early August. 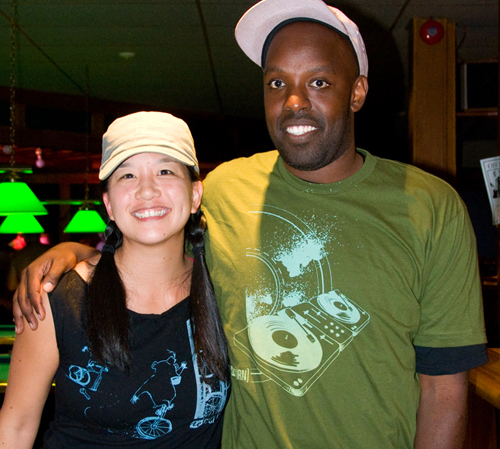 Here's a pic of me with Shad (shortly after his phenomenal set on the Saturday night)… both of us in m chen wears, woohoo! I've dusted off my serger and sewing machine, and have been hard at work with some new creations. Wanna see?